I feel in love with silk along time ago when I worked in a fabric shop and it is my favourite fabric partly because it is so versatile and also because it comes in the most wonderful shades. Unlike other fabrics which may be available in a couple of shades of one colour silk dupion is often available in what seems to be endless shades and tones, as well as various textures from slubby to fine sheen! Well those of you who know me well know that my embroidery studio has lots of silk dupion in it, much of which was collected when I was a bridal dressmaker. However I have been on the hunt for silk thread to embroider with and a few months ago I found what looked like it would be perfect for my embroidery designs. Now I admit that it is expensive but I just had to test it out. I discovered several manufacturers and decided to try YLI silk thread. If you are familiar with how threads are measured you will be aware that most of the rayon and polyester thread that we embroider with is 40 weight. Now I was unable to find 40 wt silk but YLI make 50wt silk thread which comes in 123 colours on 100 metre spools. I was very excited when they arrived and my first test out was done with my Japanese Blossoms collection inspired by Japanese silk embroidery that I saw in Florida many years ago at a Japanese exhibition. Capturing the beauty of this embroidery is very difficult in these photos but I hope this tempts you. 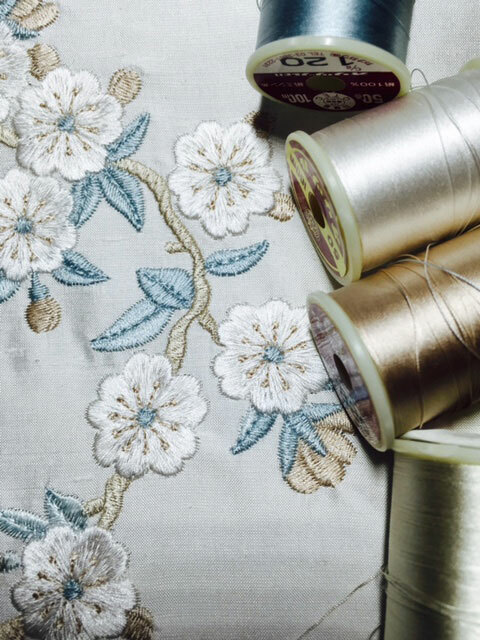 Naturally these embroideries were stitched out on silk dupion with just one backing of medium stitch and tear stabiliser. As I am currently working on the Almond Silk Paisley collection it seemed a perfect choice to test this thread out further. The design above is from the second set in the collection and this has to be one of my favourite creations so far. I was delighted with the results and had no problems stitching it out. 50wt silk means the thread is a little thinner than what we usually use but there doesn’t seem to be a coverage problem. I think the threads blend every well, better than rayon giving a lovely subtle vintage look. Colour takes differently depending on the fabric but silk gives a unique natural tone so much so that to the experienced eye the difference between pale pink polyester satin and pale pink silk dupion is obvious, even in bridal photographs. There is richness and sheen not seen on other types of fabric. 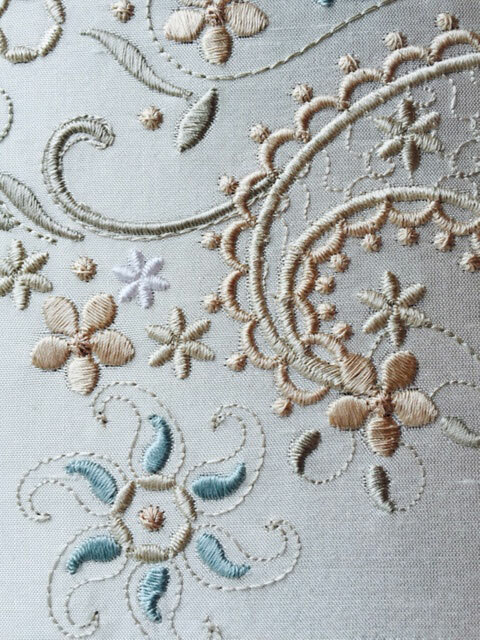 As you can tell I am besotted with silk and this embroidery thread does not disappoint. I used Schmetz gold covered embroidery needles instead of my usual top stitch needles, and slowed my machine down a little. On my machine silk sounds noisy as though it is going to break but I had only one error message to clear the bobbin area. The only down side is the expense but if you are looking to create something very special do consider the possibility. YLI Silk 50 is available online from http://www.uncommonthread.com and comes in the most gorgeous colours and hues! The second set in the Almond Silk Paisley collection is shortly to be released! How about testing it out in silk. I need to get more shades as I didn’t quite have all the right ones but the results were just as good. 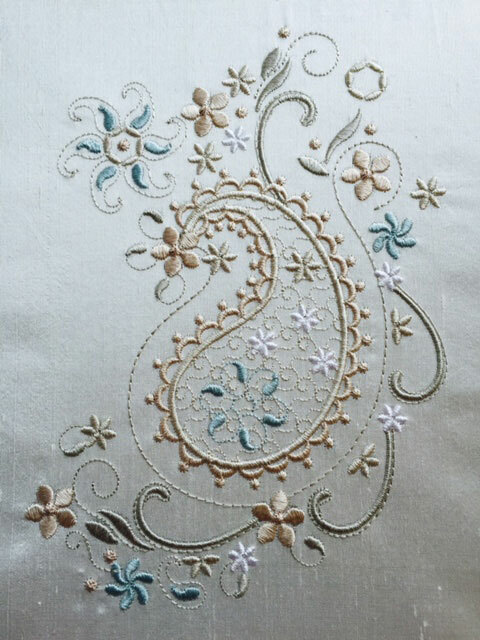 This entry was posted in Discussing machine embroidery, Embroidery projects, New Designs and tagged machine embroidery, silk embroidery thread, The importance of colour. Bookmark the permalink. 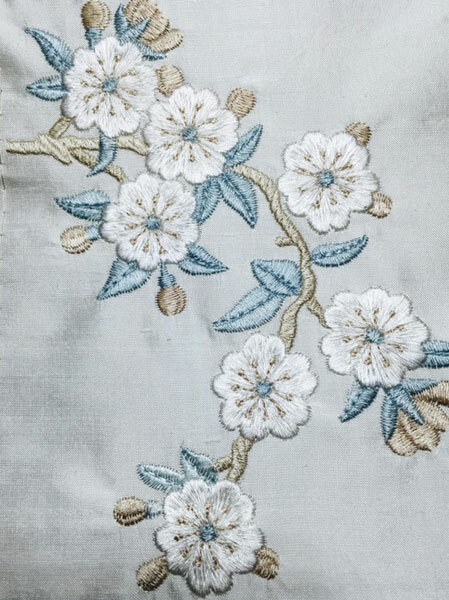 When we owned a 100 year old Queen Anne Victorian house about 15 years ago, I digitized small silk floral sprays that were sewn on pink beige silk, the crepe side of satin. At the time, I could get few threads, and used Tyre and YLI at 100 weight, and digitized for that weight. There were thread breaks on the sew out, but the final result was stunning. They were cats eye shaped insets for the border of a fringed lamp shade for a vintage 1920s floor lamp. Still have the lamp in my Asian themed formal living room in my current country type home. I love silk and your designs are stunning in the 50 wt YLI, a lovely brand. Your paisley design is stunning and I am so glad to hear about the YLI silk thread. I too love silk dupion to embroider on and had wondered about silk thread but hadn’t tried it yet. Thank you for the great information. I will try it.